Welcome Fr Grant! and Congratulations Fr Peter! On Sunday 29 June 2003, in our Cathedral, Grant Bayliss will be ordained deacon to serve within the parishes of Prestbury & All Saints'. We welcome Fr Grant and Chris to our Church family. We pray that his ministry will be truly blessed. Fr Grant trained for the ministry at Cuddesdon Theological College, near Oxford. Subsequently he has been working as a full time student researching for a doctorate in philosophy from Oxford University. Please do remember that Fr Grant's time with us is for his continued training and formation as priest and pastor. We are required to draw up a working agreement to ensure that adequate time is given for pastoral training and evaluation, for prayer and study, for the diocesan course for the newly ordained, and for personal family time. We shall no doubt gain from the gifts which Fr Grant will bring in his time with us, but it is more important that he should benefit from our prayerful encouragement. Also on 29 June, our own Peter Brown will be ordained deacon to serve within our parishes. Please keep him and Shirley in your prayers. Fr Peter has been training for the past three years under the West of England Ministerial Training Course sponsored by our own and neighbouring dioceses. This has involved quite an intensive regime of weekly lectures, seminars and regular weekend schools. In addition he has been a full member of the Prestbury Ministry Leadership Team. As we draw up Fr Peter's working agreement, we also have to keep in mind that he continues to be in a full time, demanding employment. How appropriate to be ordained on 29 June, the Feast of St Peter and St Paul! We look forward to this exciting day! Please pray for them, and for their families and sponsors, as they take this step of confirmation, as they continue ever onwards with God. Your support on the night would be much appreciated, there will be a minibus for young people wanting to go, please contact Andy Macauly for further details. All are welcome to join us in Gloucester Cathedral on Sunday 29 June at 10.15am for the Ordination of Deacons. During this service, eleven people will be ordained to the Diaconate by Bishop David. They will include Peter Brown, a member of our Ministry Leadership Team, who will be ordained as an OLM (Ordained Local Minister) and Grant Bayliss, who will be ordained as a Stipendiary Curate. Pete will be known to many of you already. He and Shirley have lived in Prestbury for many years and Pete will exercise his ordained ministry alongside his full-time job! Grant, his wife Christine and their daughter Bethany will move into Prestbury. Grant will work in all three churches of the Team Ministry: St Mary's, St Nicolas' and All Saints'. 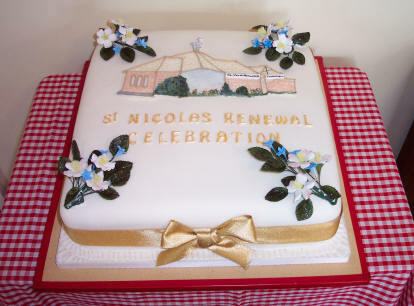 At 4.00pm on Sunday 29 June there will be a Tea Party in St Nicolas' Hall to welcome Grant and his family and continue the celebrations with both Grant and Pete. Everyone is warmly invited to attend! If you would like to attend the Ordination Service and require transport, please do not hesitate to speak to a member of the Ministry Leadership Team or to one of the Church Wardens. There will still be the normal Sunday morning and evening services in all three churches. Our bible study group continues this month. If you enjoyed the Lent studies at All Saints', or if you were sorry you didn't get along, you might find this group will help you by giving you a chance to share ideas and questions and enable you to clarify some of your thoughts. None of us claims to be an expert but that doesn't mean we don't sometimes mull over pretty weighty issues. We do feel we benefit from the time we spend together and we learn from each other's comments, though we may or may not agree with everything that is said. Nobody has to say anything and some people prefer simply to listen which is fine. We are planning to look at some of the sayings of Jesus from St John's gospel such as 'I am the good shepherd', 'I am the true vine'. It should be good. Join us for one or two or for lots. Each evening is complete in itself so you don't get left behind if you decide not to come on a regular basis. Each evening starts at 8pm and the planned part finishes by 9.30pm, after this we often have coffee together. Contact Sue Read if you are uncertain about whether it would be your sort of thing. The last year has seen much change within the youth work - much gain and some loss. We have run a website design project, re-launching the youth website, now designed by young people. The Youth Services have developed - providing creative informal worship - there have been two already and a third is planned for Sunday 6 July at 6.30pm at St Nicolas'. The Elevate group has also established itself as a vibrant and friendly place to grow in faith, with nine young people going forward for confirmation this year. Members of Elevate are now included in the highly effective Youth Forum. There has also been a pilot of the Holiday Activity Project - which produced a computer presentation on Wyman's Brook - please see Andy for a copy. Within Pittville School there have also been new opportunities to work with the Pastoral Work Area, supporting pupils as they build skills to help them integrate within the classroom. We have also continued to develop our ongoing effective and exciting work with Synergy, The Space and Pittville School Circus Skills. Changes are important because people change and their needs change. While changes can be exciting, they can also be sad. The Twilight Zone youth club, after many long years of service to local young people has closed. At the moment we are considering our provision for local young people aged 13+. For now, though, many thanks to all those who, over many years, have supported and encouraged so many young people. From my own experience of working with the team, they have been positive, welcoming, interested, supportive and good humoured in what at times have been difficult circumstances. Thanks! I believe that we serve a God who does 'prune' in order that our work might be even more fruitful. Please pray for the fruitfulness of our work with all young people we have contact with and for wisdom as we continue to respond to changing needs and opportunities. Please do get in touch with Andy Macauly if you would like to know more about the youth work, or if you would like to find out about being part of this dynamic and rewarding service to young people. We awoke very early on Maundy Thursday and set off for Gloucester Cathedral arriving at 8.30am. The skies were blue and it was a wonderfully warm day. It was exhilarating from the moment we drove into the precinct of the Cathedral. John and Jim went into Church House to be briefed. Jenny and I strolled through the cloisters, preparing ourselves for the big occasion, and where we also met up with Margaret. We took our seats early and enjoyed watching the Processions entering the Cathedral including the Choir of Her Majesty's Chapels Royal and the Choir of Gloucester Cathedral, the Ecumenical Procession, the Royal Almonry Procession and the County and Civic Procession, including the Yeomen carrying five large silver dishes containing the purses. Then the magic of Her Majesty the Queen, who was wearing a lovely outfit of pale lilac, accompanied by the Duke of Edinburgh, they entered the Cathedral to a fanfare and the congregation rose to the singing of Praise to the Holiest in the Height. The pageantry and symbolism will stay in our minds for ever - it was monumental - the organ playing and the choirs singing, sometimes accompanied by trumpets, was exhilarating. The singing of Zadok the Priest made the hairs on the backs of our heads stand on end and the fanfare for the singing of the National Anthem brought tears to our eyes. Oh! The hats, smiles on everyone's faces, friendliness, wonderful flower arrangements, the complete spectacle made the adrenalin rise. Reg was very proud to be a recipient; he looked very smart and happy. Eileen was wearing her new hat that she had gone to great lengths to obtain and David looked enormously proud of his mother. It was good to see Father Stephen on his arrival. The five recipients from Prestbury received their purses from the Queen on her second round of giving. From her seat near the High Altar, which was adorned with huge white lilies and the Cathedral silver, she made her way down through the choir, distributing to the North side, accompanied by the Lord High Almoner (Bishop of Manchester) and four children carrying posies. The Queen came firstly to John McKenzie (John and I felt very privileged to be seated in the choir, diagonally opposite the Queen and the Duke) - she gave John a wonderful smile when he was presented with his purses, which he says will be his lasting memory, and he said 'Thank you, Your Majesty'. Just down the steps from the choir and at the top of the north nave Eileen Jones stood and received her purses, and David was behind, lapping up the spectacle. Jim Moore was a few seats from Eileen and received his purses, accompanied by his daughter Jenny, who emotionally and proudly was behind him. The Queen presented purses to recipients down the North nave and then she came up the north transept where Reg Viveash received his purses, and Raymund Waker who was a few seats up from Reg, next received his purses, with Margaret enjoying the occasion enormously and looking young in her trouser suit and dainty hat. The distribution of Alms and the washing of the feet on Maundy Thursday are of great antiquity, and can be traced back to the twelfth century. From the fifteenth century the number of recipients has been related to years of the sovereign's Life. Recipients are now pensioners selected because of their Christian service to the church and community. The distribution is in two parts, and the gifts are Symbolic and highly prized. The red purse contains an allowance for clothing and provisions, (now a £5 Coin and 50 pence coin) formerly given in kind. The white purse contains Maundy coins - silver pennies, twopences, threepences and fourpences, as many pence as the Sovereign has years of age. The five alms dishes date from the reign of King Charles II. The ceremony has been performed twice in Gloucestershire during our present Queen's reign - 1971 in Tewkesbury Abbey and 2003 in Gloucester Cathedral. We all felt very privileged - it was a great tribute to everyone who received the Queen's gift to them - it was an occasion that those who attended felt very grateful for the opportunity, and it was a day that will stay in our hearts and minds for ever. Three o'clock in the morning was a sleepy time to begin our Pilgrimage to Rome but its advantage was that we were lunched and ready for our first tour the same day. Giorgio, our enthusiastic guide, and Emilio, driver of a brand new 24-seater coach, were constant companions. The Trastevere region, meaning 'across the Tiber' is where the 'cockneys of Rome' live and are regarded as descendants of ancient citizens. There we visited the church of St Mary founded in the 3rd century, that is, even before the Roman Empire became Christian. Next day, a site even earlier, we descended deep down two or three flights of stairs to a musty vaulted room, with stone seats round a central altar whose carving represented Mithras slaying a bull. To obliterate the memory of this pagan influence an early Christian church was built above and above yet again, the 4th century church with magnificent Byzantine mosaics. We felt close to the life of St Paul and his associates since this earliest church was possibly the home of St Clement mentioned in Philippians 4:3. One cannot help but be moved by such antiquity. Its central altar is sunken and surrounded by pillars and a walkway gently decorated with birds, branches and rural scenes. The reverence felt in such places was in stark contrast to the oppressiveness of the Colosseum and the powerful dominance of the Roman Forum even as a ruin. Assisi was so different - peaceful and quiet, high on its hillside with snow on the ground. The white doves being nurtured by the resident communities of St Francis and St Clare only added to the charm. It was a moving experience and our mutual thanks go to Fr Stephen for this, the first pilgrimage he has organized but hopefully not the last. For some the afternoon consisted of a relaxed afternoon with a BBQ, catching up after a busy weekend. Many thanks to all those who supported this enjoyable event and the very many who contributed practical help. The team of people who are happy to make visits to folk who are not very well either at home or in hospital is working well and being appreciated by many. But it is important that the team should know who falls into this category. We have no desire to force our company on anyone who really does not wish to receive a visit from somebody from church but equally important it would be very sad if the team misses someone out who then gets the impression they have been overlooked and forgotten. So PLEASE do your bit and help to keep us informed when you yourself or a friend or neighbour is sick and would like to be visited. Di Petchey is the contact at St Mary's and John Elliott at St Nicolas', or anyone on the Ministry Leadership Team. Four-year-old William, one of our Rockers, left us last November to travel round the world with his parents. After visiting Thailand, Hong Kong, Singapore, Australia and Tasmania, William finally reached New Zealand in February and has spent several weeks travelling through South Island, camping and staying in hostels. In Nelson they visited some friends and stayed in their caravan, which was dry and warm. They went to the friends' land, and stayed in their really cosy cabin. The land had been used for forestry and the current project is taming the wilderness into a garden. William had many evenings stargazing. The Southern sky is so very bright with millions of stars which cannot be seen in the Northern Hemisphere. Orion was visible, but 'upside down'. Then both families drove up to Abel Tasman Park, which was really lovely and they enjoyed the peace and quiet and opportunity to play around on the beautiful beach and estuaries in the canoes and dinghy. William enjoyed playing with the two older children, who were very tolerant of him tagging along and made sure that he had a great time. Again, lovely woodfires and beautiful starry skies in the evenings and forest walks during the day. William saw Glow-worms which was exciting as he had to wait until it was dark. One day they stopped by the road to buy some really cheap apples and had a guided tour of the apple-packing factory. William saw the apples which had been picked that day being taken out of their pallet boxes and loaded onto a conveyor belt where they were washed, sorted, graded and then put onto trays and boxed up for shipping to the UK and USA. He was excited to recognize the same packaging on the boxes as he had seen in the supermarket at home. Back in Nelson, William went to the Cathedral and his Dad took him up to see the organ. The lady organist played William some familiar tunes and then let him try. You can imagine how much a four year old enjoyed being allowed to make so much noise!! Next William visited Franz Joseph Glacier and Fox Glacier, which were very impressive and he could see the U-shaped valley that the glacier had formed over many thousands of years. In Queenstown William had a fun trip up Bobs Peak on the Gondola and a go on the Luge from the top. He wanted to go on the really fast course down but the beginners' course was fast enough! Next day they went out on a boat which used to take deliveries to the cattle and sheep stations around Lake Wakatipu. The size of the sheep stations is amazing. One of the lake front stations is 100,000 acres and has 33,000 sheep and thousands of cattle too!!! Then a couple of day trips to the famous fiords of the region, Milford Sound and Doubtful Sound. The scenery was awe-inspiring and the waterfalls very beautiful. The weather was calm so the captain took the boat right out and turned it around so that they could see the same view that Captain Cook had seen so many years ago. William was very lucky and saw many bottlenosed dolphins and really enjoyed watching their antics as they chased each other around the boat. In September 2002 I filled out a form I thought at the time I might live to regret......the application form for the 2003 London Marathon! I had never run the marathon before - never really enjoyed running - but I thought it would be good to do the once - help me get fit and probably quite enjoyable. I started training a bit in October and November - the first few runs were very painful - going only 2 or 3 miles and then feeling absolutely exhausted on my return - I kept thinking I will have to run another 23 miles at least on top of this - a very worrying thought!! The training slacked off quite a bit in December - I was busy at work and in the run up to the Christmas season there were a number of parties to attend - all of which took precedence over the training! I think it was towards the end of December when I received official confirmation that I had managed to get a place - very mixed emotions at that stage - happy; but also very worried - because up to that stage I kept telling myself there was a chance I may not be accepted and may not have to go through all the pain! Post Christmas the training started with a renewed vigour - the marathon was just over 3 months away and I knew I had to really step the training up a gear at this stage. Throughout January & February I was running 2 or 3 nights a week - about five miles a time and then tried to run 10 miles at the weekend. It was during this time that I thought if I was going to be putting myself through so much pain that I should raise money for charity at the same time - I decided to run for Dreams Come True charity - that enables terminally ill children to go on holidays of a lifetime - such as to Disneyland. I thought this is a very worthwhile cause - I know how much I enjoy holidays and wanted to help these children. January, February and March seemed to go so quickly and suddenly it was April - the marathon month! Two weeks before the marathon I did my furthest run to date - 17 miles - it was OK - but the final 3 miles were really hard - I could not envisage going another 8 miles on top of that on the day! April 13th was a bright and sunny day across London and if anything, a little too hot. The run started at 0945 - but you have to be at the start a while before that to get ready and hand your bag of belongings in for transportation to the end. I could not believe in getting to the start how many people were running - there were around 32,000 people running this year. I started off with some of my friends and ran with them for around the first 8 miles - which were not too bad - the training had paid off! The number of people and the importance of running at your own speed meant that we did not stick together all of the way. Tower Bridge is half way - 13 miles - and again I was still OK at this stage - but I knew that I had completed half! One of the hardest parts was heading down a road towards Canary Wharf when I was at 14 miles - and on the opposite side of the road seeing runners coming back who were at 20 miles. Canary Wharf was a more challenging part - not as many crowds supporting - although I did see my Mum and her friend at this stage which was a massive boost. At 20 miles the pain was really starting and it is hard to express how hard the last 6.2 miles of the race were - felt about three times as long as the first few miles! I knew that the quickest way to finish and be able to rest was to keep running, so although I desperately wanted to walk and rest, I made myself keep running. ...............Finally I came around past Buckingham Palace after running down the seemingly never ending Embankment - the crowds are really vocal at the end - which is really needed - I saw the end and crossed the line. The sense of achievement at the end is amazing; but your body is so tired and drained of all energy you are in a bit of a daze. I managed to retrieve my bag and got to the Sports Café where I was meeting my supporters for some re-hydration and a bit of food. Looking back I am so pleased that I managed to complete the race - and very pleased with my time - just under 4 hours 19 minutes - I was 11,111th person to cross the line! It is something I will always remember. I would like to thank you all for your generous sponsorship - it certainly helped to motivate me and I know it will make a massive difference to the lives of the children who are given a holiday of a lifetime - in total I managed to raise about £1,200. Unfortunately I had to postpone my entry to the marathon for a year because of leg injuries. Ironically the sports therapist thought that they were caused by overtraining. I cannot describe how upsetting and frustrating it was to have to make that choice. Thankfully Outward Bound have said that I can carry all my sponsorship over to next year which is excellent, so the marathon is definitely postponed rather than abandoned! Thank you to all those who sponsored me this year. I hope that I shall be able to use it next year. At the time of printing the total raised so far in the Parish is £4806.88. This total includes the £45.70 raised by the St Mary's Sunday School shoe-shine. The rest is from house to house collecting. Many thanks to all who helped in any way. Ruth Rudge has taken over from me as Box Holder Secretary and will be contacting box holders in the near future to make arrangements for the annual collection of their contents. The new coffee rota for the Summer is now in the kitchen and porch at St Mary's and will take effect from Sunday July 6th. If the dates are not suitable please arrange to exchange with someone else and amend the lists accordingly. This quarter we plan to donate money to World Vision. Thank you for your continued support.